Ok, Reader Friends. 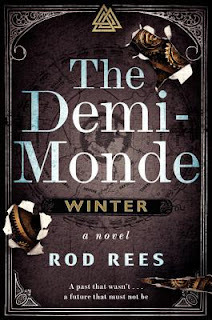 I feel like I'm always learning new things about the blog world and the book world, and the Demi-Monde series has certainly taught me things. Mainly, I learned not to join a tour for the second book in the series because you think you will like the series. 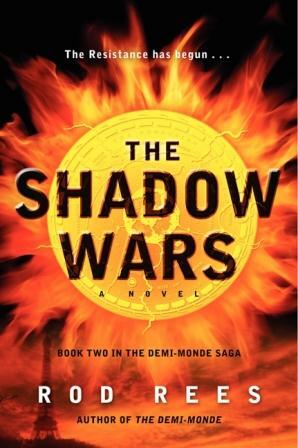 I had already received the Demi-Monde and it is SO my kind of book and I'd been looking for a reason to read it, so I figured joining the tour for the second book, The Shadow Wars, would be a great way to force myself to jump in. Here's the problem: I hated it. And I HATE it when I don't like books that I'm part of a tour for. I love the TLC ladies and I hate feeling like I've let them down on a tour. I also think my dislike might not have been so strong if I hadn't made myself read both of these back to back. Had it just been one, I would have been more like "meh, this isn't for me." But having to consume approximately 1000 pages consecutively of a story I wasn't into with characters I didn't like, in a voice that grated made me irrationally angry. All of that to say, I'm going to do my best to temper this review with the knowledge that I made a mistake in choosing the second book before reading the first and that had it just been one book I probably wouldn't dislike it this much. This is the cover for the first book in the series before the book was repackaged. It's very steampunk, which is what drew me in. The basic premise is that in the future the US military created a virtual reality simulation of our world using major cities and randomly inserted the personalities of major criminal figures (Mengele, Heydrich, Robespierre, and Torquemada to name a few) as well as overpopulating the world. The program insures that there will be constant political strife and war amongst the four major populations groups, as they are led by evil masterminds and programmed to have wide variations in political, religious, and sexual ideology. The government will then use this Demi-Monde to train new troops. In the first book, the President's daughter is lured into the Demi-Monde and kidnapped. The army finds a young jazz singer named Ella who is reluctantly recruited to go into the Demi-Monde (which the government has already lost control of) and retrieve the President's daughter. In the second book, our main characters are still trapped in the Demi-Monde and are faced with an even greater evil than the computer-generated villains of the first novel. That should cover the basics. My main problem with the writing was that there was WAY too much going on. During the first book, we have this whole totally unsubtle Judeo-Christian theme. The computer system is called ABBA and everyone in the Demi-Monde considers ABBA to be their god. When Ella is able to save a population of Eastern Europeans known as the nuJus (ugh, so offensive!) to a "promised land" of safety, she is dubbed the "Lady ImManual" based on the IM Manual she uses to break the code. At first I thought we were in for a skewering of organized religion, but that never really happened. So I figured the reason for all the religious references would be made clear in book two. Except that never happened. Book two seems to go in this completely unrelated direction of supernaturalism. Where as the first book was focused on a future version of the world we live in and dealt more with technology and had the steampunk feel that I appreciate, the second book goes off into the supernatural, introducing vampire-like creatures and all kinds of mythological gods and goddesses and it all just made no sense in any way. Finally, I have to mention the many, many, many holes in logic. Like, why would the United States of the future choose to create a world to train its soldiers in which modern technology doesn't exist? That just seems dumb to me. Even in combat situations in third world countries, many rebel groups have semi-automatic weapons. Wouldn't we rather train our soldiers in a world where those things exist? And the whole "if you die in the Matrix Demi-Monde, you die in the real world" thing also made no sense. So we're going to train our soldiers by putting them into a life-threatening situation in virtual reality? If they can die in the game while they train to fight, why not just put them in the actual combat situation where they might also kill an actual enemy instead of a computer simulation of an enemy? Honestly, I don't think I'm nit-picking here. If you're going to write speculative fiction, you can't just put down anything you feel like without regard for logic. Yes, you're writing a make-believe world, but your world still has to make sense. I think I could have overlooked the mistakes in writing and at least somewhat enjoyed the book if it weren't for the use of alternate spellings/homonyms for no real reason. For example: soldiers in the future version of our world are called Neo Fights. Like neophyte, but spelled differently, get it? A few others, just off the top of my head: HerEticalism (female-dominated religion/government), Suffer-O-Gettes (violent women who want to make-men-suffer-o-gettes), UnFunDaMentalism, HimPerialism, and on and on and on. At the best it's just annoying, at the worst it's flat out offensive. Women who like other women? LessBiens (because they're Less Bien/Good). Also, everyone with dark skin lives in a place called Noirville where they hate women and live like savages. I can't make this up. By the second book, I was twitching at every senseless homonym and offensive stereotype. I know that a huge part of the plot revolved around racial and gender-based conflicts between people groups, but I felt like the words chosen to represent these groups were kind of gross, for lack of a better word. Again, it comes down to an issue of logic. Would it make sense for a Heydrich or Mengele to come up with a racist or sexist term to define a people group? Yes. Does it make sense that the US government of the future came up with racist and sexist terms to describe the fictional world they created? No. It needs to make sense. And when it doesn't make sense in terms of the world we need to accept as real, it comes across as the writer's bias instead of the character's bias. It's a do not recommend on all fronts. A major thank you to TLC for setting up the tour and, as always, check out the official tour site to see the reviews of others and get a balanced perspective from other readers who may have enjoyed the books more than I did. I'm sorry that this book didn't work for you, but thanks for being a part of the tour.